Timeframe: in stock – 3 days (you will be notified of your delivery date within 1 day of purchase, or contact us direct before purchase) Our Hammocks come in all sizes, standard size showing a double hammock with hook connection. 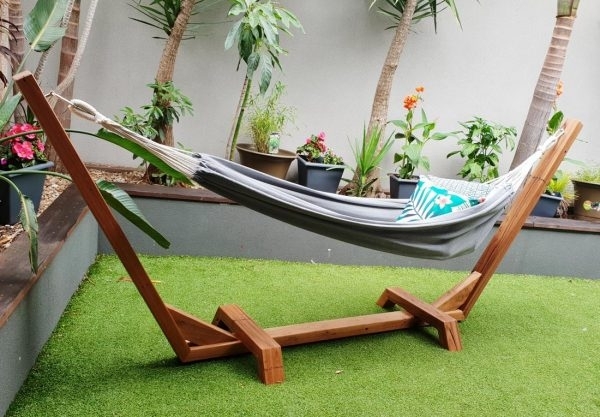 See below a guide on your freestanding hammock size, and we also custom make hammocks to suit your needs, so please send us your hammock measurements for quotation including delivery. Made with the highest furniture grade outdoor hardwood timber (Australian Spotted Gum), perfectly suitable for Australian climate. 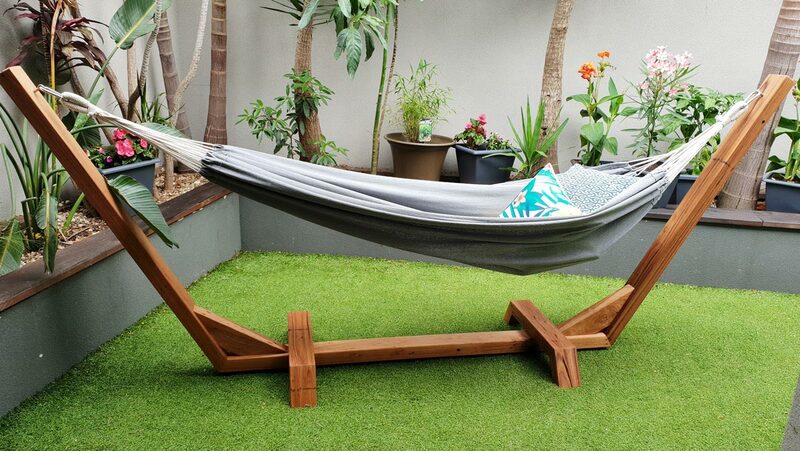 Based on standard size double or single hammock at sizes shown below. Fully assembled: 3000mm across top with 2820mm in between hammock hinges. Height in total is 1240mm with height of hammock resting at each point currently 1140mm. Delivery price: we are pricing the delivery at $75 around Melbourne, and estimations at $150 – $175 Australia wide. Trade Enquiries need to send details to: info@footprintfurniture.com.au or contact us at 0437 858 118, but the short answer is, YES, we do trade!!! 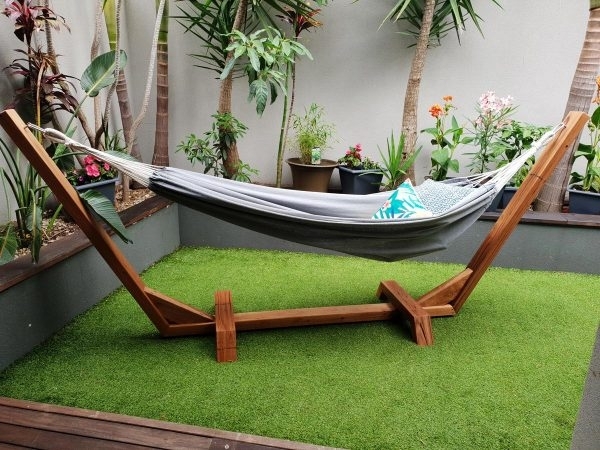 T & C’s – all hammocks are supplied by Bunnings, Ozetrail or Hammocks Australia. Check out their websites for each of their hammock T&C’s. Our Hammock stands are under Footprint Furniture T&C’s which you can view on our website here. All products created through Footprint Furniture have been done with the highest of care to ensure quality & product safety is of high priority. For further information on our products & assurances, feel free to contact us at info@footprintfurniture.com.au or contact us at 0437 858 118.